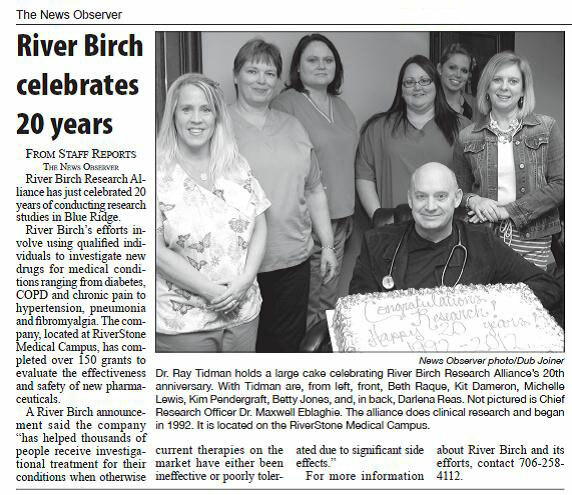 River Birch Research Alliance's clinical research team has, collectively, over a century of healthcare training, patient care, and research experience. Patient care remains our highest priority as we strive to bring new medications in clinical trials to you. His impressive resume reveals a multi-disciplinary, multi-faceted professional. Prior to pursuing his interest in medicine, Dr. Tidman was an engineer. In his senior year, Dr. Tidman carried out a research project looking into blood flow dynamics in normal versus atherosclerotic patients: a multi-disciplinary subject indeed, bridging his interests in engineering physics and medicine. Dr. Tidman later carried out pre-clinical training at the Medical College of Georgia and obtained his medical degree from Case Western School of Medicine in Allopathic Medicine. Dr. Tidman received many accolades, not all of which were for his outstanding academic achievements (Lang Award) but also for his contribution to the medical community (CIBA Award). It was a few years into his medical profession when Dr. Tidman founded RBRA and devoted part of his time to clinical research. Over 25 years and hundreds of clinical trials studies later, Dr. Tidman is a distinguished principal investigator and creative thinker. He is on the Board of Directors for RiverStone Mountain Professionals, LLC. Dr. Tidman holds privileges at Fannin Regional Hospital and Piedmont Mountainside Medical Center. Dr. Tidman is board certified in Family Medicine and holds professional memberships including the American Academy of Family Physicians, Georgia Academy of Family Physicians and the Medical Association of Georgia. Lisa Ingle has been with River Birch Research Alliance since 2016. She has over a decade of experience in the medical industry. This includes seven years as an LPN for a Nurse Midwife, and five years as an LPN for a Physician’s Assistant. Lisa grew up in Fannin County and worked for Levi Strauss & Co. for 16 years until the plant closed permanently. She attained her Associate's Degree as an LPN and has worked in the medical field since 2003. Michelle joined River Birch Research Alliance in 2008; altogether she has more than two decades of medical experience. Michelle is a lifelong learner and enjoys working in research for the opportunity to continually be learning. She strongly believes the work our team does is making a difference in our patients’ lives. She also enjoys doing work that ensures the constant improvement of healthcare and the medical industry as a whole. Maureen Nelson joined River Birch Research Alliance in 2015 as a Clinical Research Coordinator. With years of experience working in the medical field, Maureen brings to RBRA her sharp focus and friendly disposition to create a comfortable environment for patients participating in the clinical studies.